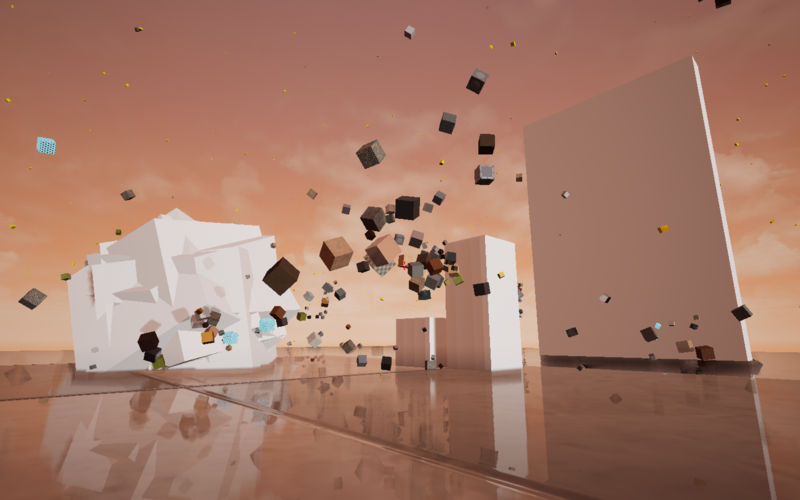 A procedurally generated interactive environment whose movement is driven by the trigonometric functions of Sine, Cosine, and Tangent. Developed with Unreal Engine 4, in about 4 hours. Created for 7DFPS 2018 & PROCJAM 2018. * For the best experience, please download the macOS or Windows versions. The HTML5 version is provided to allow for the most people to experience SiCoTa N.
I really dig this. I like the scaling cubes effect. Could use some blurry fx (bloom or such) to make up for some visual glitches but also maybe not and that's actually sorta cool. How did you feel about using Unreal Engine in a jam (fast dev cycle)? Thank you for your comment! I’m glad you liked SiCoTa N. :-) I hadn’t thought about adding more visual effects. I do kind of like seeing some of the glitchy stuff. But I’ll have to keep more effects in mind for future jams. I’ve been using Unreal Engine 4 (UE4) for years, so it’s fairly second nature for me at this point, which means I can work pretty fast for jams. Using UE4’s Blueprint visual scripting system really helps to quickly prototype out ideas, and is really well suited to short dev cycles like a jam. All of SiCoTa N was programmed using Blueprint.